Bread pudding was originally created as a way to make stale bread taste fine and dandy. This dessert is still incredibly popular today, and it's a perfect representative of "comfort food." Many people like to serve it on holidays like Thanksgiving and Christmas, but it's a delicious treat any time of year. Spread the bread scantily with butter, cut into crouton-size pieces, and put into a 2-quart baking dish. In a bowl, beat the egg and the sugar together slightly. Add the vanilla and milk to the egg mixture. Mix well and pour over the bread. Let stand for half an hour. Sprinkle the raisins over the top and work them into the mixture. Bake at 350 degrees for about 45 minutes until set, and the top turns a light brown. 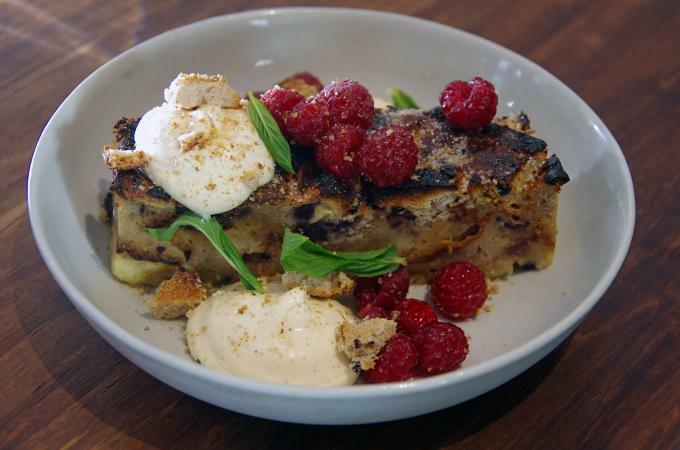 Bread pudding has been around for centuries and there are innumerable ways to jazz it up. Make your bread pudding sparkle by adding fruit or nuts to the recipe. For example, you could add items like dried cherries or cranberries, blueberries, raspberries or even strawberries. Apples and peaches would also make nice additions. Pine nuts, walnuts or hazelnuts would also impart additional flavor with a bit of crunch. You can also use half & half or cream instead of milk. If you're feeling daring, try making this recipe with chocolate milk. Try old doughnuts or sweet rolls in place of the bread. Old cinnamon rolls would make an awesome bread pudding. Just keep in mind that you may want to reduce the amount of sugar in the original recipe if you're using bread that's already sweetened. Bread pudding can be made with just about any type of bread, including wheat, French, or sourdough. If you want a gourmet bread pudding, try using egg bread, brioche, or another gourmet or specialty bread like Hawaiian bread. It will take your dessert to a whole new level. Try adding a few drops of whiskey or strong liqueur before baking. For example, a little coffee liqueur would make an excellent addition, as would an Irish cream. An orange liqueur would also work nicely with the vanilla flavoring of the original recipe. It's interesting to note that bread pudding recipes have existed in many cultures, from ancient Egypt to the Middle East and medieval Europe. If you haven't had the opportunity to try this homespun delicacy, there's no time like the present.